If you’ve been staying up-to-date on our blog, you know that we have been doing a short blog series about interesting facts about the organ. The organ has been around for more than a thousand years in a variety of forms and until recently, has been the center of culture, whether at banquets and circuses or church ceremonies and Catholic mass. Though the organ isn’t still at the center of daily life for the average American, the organ is still used in popular music and in churches nationwide, and with younger generations looking toward the past for inspiration for style and daily living, it is only a matter of time before the organ sees itself in the spotlight of popular culture once again. 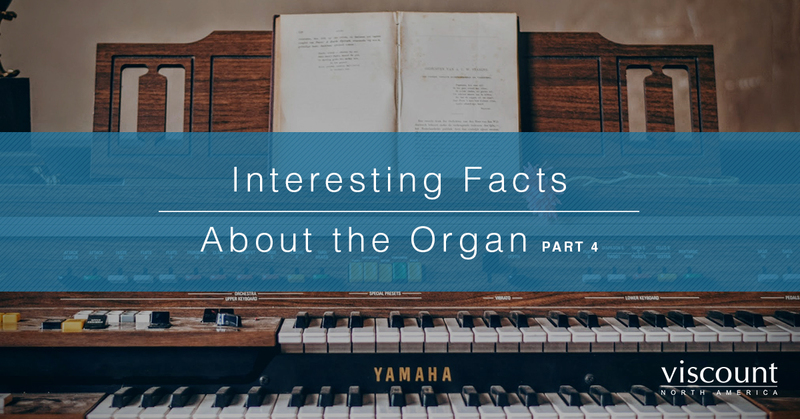 Today, we want to continue sharing interesting facts about the organ. We at Viscount are passionate about the organ and craft our own organs with the highest quality materials and the best technology on the market. To learn more about our digital organs, or to find your own church organ, visit our website. The organ has continued to take a variety of forms throughout the years and to be operated by a variety of means. In 1855, a steam-powered organ was introduced at the Great Exhibition in London’s Crystal Palace. Unfortunately, because of the calliope’s volume, it was banned to be played within the city limits. Hammond claimed to introduce the first electronic organ in 1934. Hammond, a clock manufacturing company, had produced a keyboard instrument that was supposedly an equal to the pipe organ. However, in 1938, the FTC ordered a cease and desist against Hammond for their claims could not be substantiated. In 1873, many organs found their way into churches, schools, and civic institutions, due the philanthropic actions of Andrew Carnegie. Over 8,812 organs were donated during a time when organs were still very much at the center of culture. There were still many composers writing beautiful music just for the organ and many musicians were mastering this great instrument. As mentioned, the organ saw much popularity in America in the 1800s and early 1900s. Not only did the number of organ pipes manufactured double in 1927, but organs were the center of many concerts, entertainment, and education. World class organists played concerts of 30,000 people. The organ has truly captured the hearts and minds of people around the world for generations. To learn more about the organ, music, and Viscount organs, follow our blog! Are you looking for a high-quality digital organ? Viscount has engineered a digital organ—unlike Hammond’s 1934 instrument—that can give you the same quality of sound as pipe organs found all over the world in a variety of environments. Physis® technology powers our world class digital organs. Physis allows the player to enjoy three-dimensional textured sound through physical modeling. Learn more about the capabilities of Viscount’s digital organs and to find a dealer on our website.